three that I'll be showing together later this spring. this lovely woman holding a beautiful new baby. new love mothers have for their babies. snapped off a few shots and gave her my card. The baby's name is Daphne -- a lovely name. here on this 3 x 4 foot canvas. This is a very early stage, so a lot could change. But thank you Daphne and Daphne's mother. Labels: Portrait. work in progress. Acrylic on canvas. Barbara Muir © 2014. Toronto. Canada. 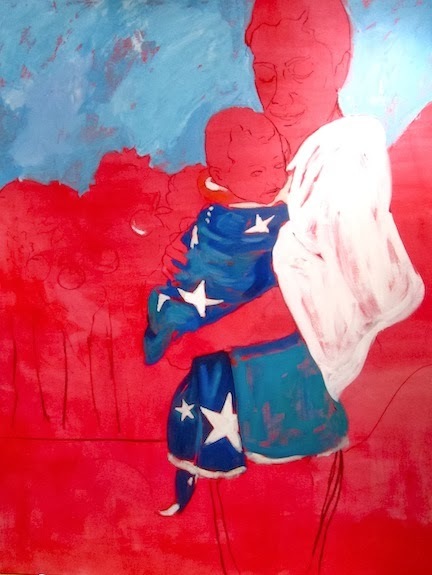 This already has a wonderful quality to it, I love the design, the stars in the fabric, the way the mother hugs her baby to her - I know this will be another magnificent portrait. I am excited about it. I plan to hold onto that feeling, and your kind comment will help me do just that. When people offer to let you photograph them at random it is such a gift. She has my card, so I hope she looks me up and watches as this painting progresses. I have to second what Marcia said: great design ... Love the big blocks of color. Looks very intriguing as it is now, but I look forward to seeing you develop it! I am slowly planning a triptych. Huge. So I am inching away along deeply influenced by recent reading I know. This could change and change again. But that's fun too. Down to basics -- the gray scale.